For several centuries, people in many parts of the world have been using turmeric obtained from the stems of Curcuma longa L., a spice used in traditional Ayurvedic medicine. Curcumin, the main active component of turmeric, was tested in a large number of scientic studies. 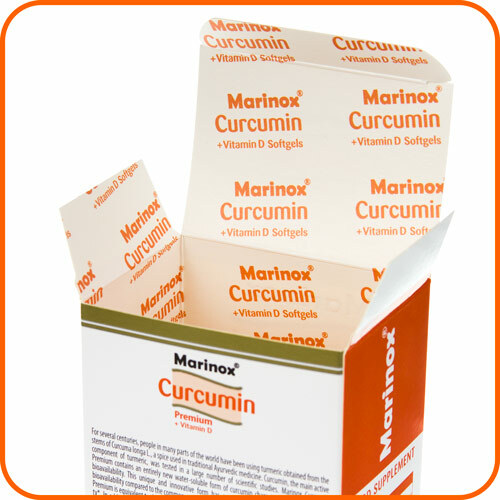 Marinox® Curcumin Premium + Vitamin D contains an entirely new water- soluble form of curcumin characterised by its excellent bioavailability. 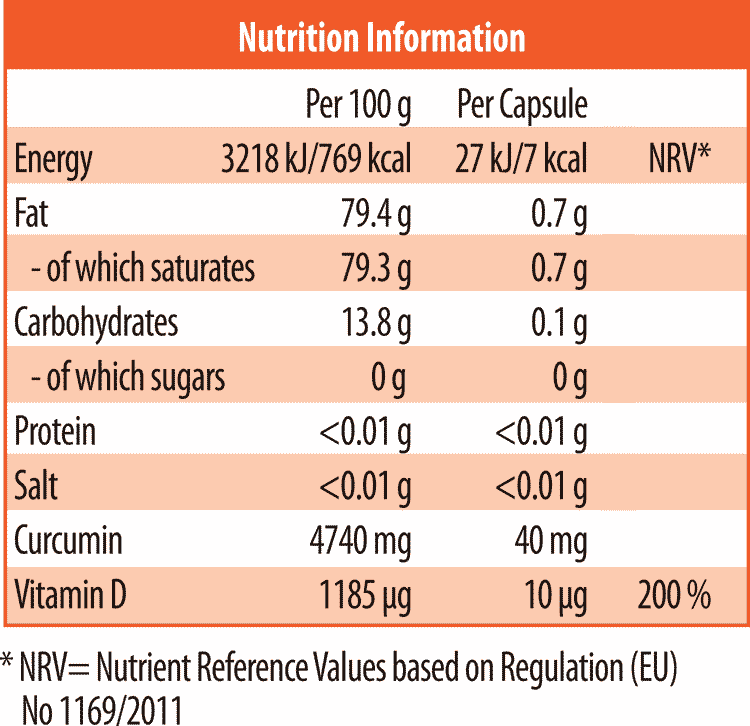 This unique and innovative form has a more than one hundredfold improved bioavailability compared to the common powder form: taking only one capsule of Marinox® Curcumin Premium + Vitamin D is equivalent to the intake of 4g of regular curcumin powder in regards to its bioavailability. 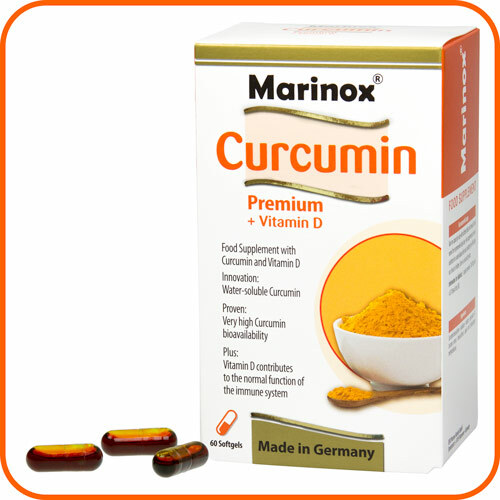 * In addition, Marinox® Curcumin Premium contains Vitamin D3 that contributes to normal function of the immune system. *Schiborr et al., ”The oral bioavailability of curcumin from´micronized powder and liquid micelles is significantly increased in healthy humans and differs between sexes.” Molecular Nutrition and Food Research 2014, 0, 1-12. Curcumin solubilisate (polysorbate 80, triglyceride, curcumin) 71%, capsule (bovine gelatine), humectant (glycerol, sorbitol, water), cholecalciferol. 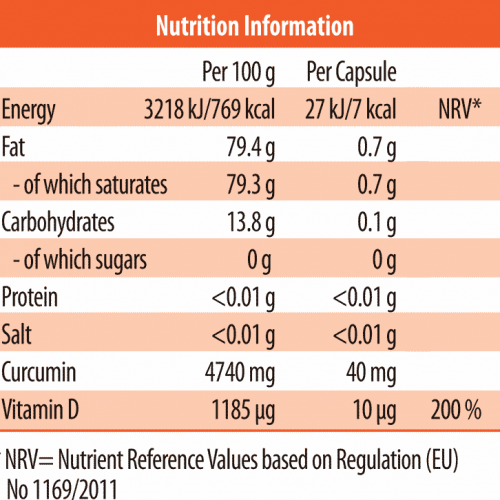 1 capsule provides 27kJ/7kcal and <0.01 bread units (BU).